Julian Langham was poised on the brink of a dazzling career when the lawyers lured him into making a catastrophic mistake. Now, instead of the concert platform, he has a title he doesn’t want, an estate verging on bankruptcy … and bewildering responsibilities for which he is totally unfitted. And yet the wreckage of Julian’s life is not a completely ill wind. For Tom, Rob and Ellie it brings something that is almost a miracle … if they dare believe in it. Meanwhile, first-cousins Arabella Brandon and Elizabeth Marsden embark on a daring escapade which will provide each of them with a once-in-a-lifetime experience. The adventure will last only a few weeks, after which everything will be the way it was before. Or so they think. What neither of them expects is for it to change a number of lives … most notably, their own. And there is an additional complication of which they are wholly unaware. The famed omniscience of the Duke of Rockliffe. Cadenza is the sixth and sadly the final book in the superb Rockliffe series and, as I have come to expect from Stella Riley, I was totally enchanted by this beautifully written story. In this series, Ms. Riley has created some of the most memorable heroes and Julian definitely belongs to their exalted ranks. He is such a complex character and surely one of the most refreshingly unusual heroes to grace the pages of a Historical Romance. He is gentle, kind and shy, with a sweet smile, guaranteed to pierce even the stoniest heart. But what a dramatic transformation when he plays the harpsichord – gone is the hesitant, socially awkward young man and, in his place, is someone who is relaxed, confident and totally in command. I put it down to Ms. Riley’s ability to create such an endearing character who effortlessly steals your heart by just being himself. The romance between Julian and Isabella (Belle) develops slowly which makes it feel natural and believable. Young ladies like Belle have always terrified Julian, leaving him tongue-tied and feeling like a fool. Initially he is wary of her, but soon discovers that Belle is not like the other ladies he has known with their lingering, speculative glances. He finds that he can talk to her without feeling clumsy and foolish and her warm, melodic laugh is like music to his ears. …a laugh which made his insides uncurl and yearn to hear it again in order to recapture the elusive phrase it had brought to mind. A rondo in a bright key, he decided. G major, perhaps? I love Belle and she is the perfect match for Julian with her cheerfulness, determination, resilience and obstinate streak. When she sees him struggling to keep the impoverished estate going, she tries to help in practical ways and recognising that, without his music, there will always part of Julian missing, she is determined to help him achieve his dream of becoming a concert performer. Ms. Riley’s eloquent writing conveys their growing feelings for each other so beautifully. His arms went round her automatically and for perhaps three seconds, they remained perfectly still, startled green eyes locked with grey ones in which laughter was fading into confused awareness. In the second his mouth touched hers, the entire world was full of music … rare, elusive and utterly compelling. A melody more beautiful that any he had ever either heard or even imagined. Again, we are treated to two romances running concurrently, the other being a secondary romance between Elizabeth (Lizzie) and Ralph Harcourt, Earl of Sherbourne. Those who have read Hazard will remember Sherbourne as Genevieve’s loathsome brother and it was hard to imagine how Ms. Riley could possibly redeem him. It is a mark of her skill as a writer that she redeems him without changing his intrinsic character. The gradual revealing of his past is masterfully done and the truth surrounding the duel was an unexpected twist and one I would never have suspected. I found myself not only sympathising with Ralph but also rooting for his Happy Ever After. I thought it was realistic that Aristide and Genevieve were never going to suddenly forgive Ralph, given his actions in Hazard, but I was pleased to see the hint of a possible future reconciliation. Ms. Riley’s secondary characters always add richness and depth to her stories, whether they be much-loved characters from previous books or new characters. Tom, Rob and Ellie (not forgetting Figgy), the children whom Julian ‘adopts’, are just delightful and watching him gain their trust, loyalty and love, by just being himself, is so touching. I really like Max Brandon who is the sort of elder brother every girl should have and with a great sense of humour as well. As always, the all-seeing, all-powerful Rockliffe is there to take charge and deal with the consequences of Belle and Lizzie’s deception in his inimitable way. I love how, beneath that ducal exterior, lies a man who can be kind, unbiased, generous and loyal to a fault when it comes to those he cares for. We see these qualities in the way he bestows his patronage on Julian and his belief in and support for Sherbourne. Oh, and I also love his dry wit. “You have a great deal of it”, grinned his wife. Ms. Riley’s musical background and her in-depth research really show in her detailed descriptions of both the harpsichord, its workings and Julian’s repertoire. I love how she makes you feel as if you are in the room listening to him play and experiencing all the emotions his audience are. Under ‘Extras’ on her website, Ms. Riley has provided full details of the repertoire and, so readers can experience Julian playing, there is an opportunity to hear one of the pieces played by Jean Rondeau, a young, French harpsichord virtuoso. Now, that is what I call going above and beyond the call of duty for her readers! I have yet to read Garland of Straw, the second book in Ms. Riley’s Roundheads and Cavaliers series, but I was interested to see in the Author’s Note that Arabella’s great-great-grandparents are Gabriel and Venetia, the hero and heroine of that book. While I am sad to see this wonderful series end, I am waiting with relish for whatever Ms. Riley pens next. MY VERDICT: A wonderful ending to this superb series. HIGHLY RECOMMENDED. Hazard: a game of Chance and Luck, made riskier when Fate is rolling the dice. For Aristide Delacroix, the first throw summons shades from his past. A man he had met, just once, over a card-table … and the lovely girl indirectly responsible for plunging his life into catastrophe. For Lord Nicholas Wynstanton, tired of waiting for Madeleine Delacroix to make up her mind, it slyly suggests he begin a whole new game with loaded dice; while for Madeleine, it devises a terrifying lesson in missed opportunities and the uncertainty of second chances. And for Genevieve Westin, hoping widowhood will be happier than marriage, it brings a rude awakening – leaving a single, wild gamble her only option. 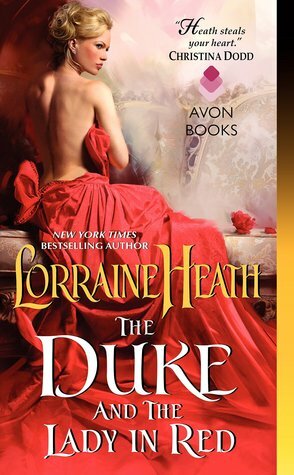 A cardsharp turned businessman, a duke’s charming brother, a stubborn, razor-edged beauty and a desperate widow. Four players in a game of Hazard … all playing for very high stakes. In HAZARD, the 5th book in Stella Riley’s wonderful Georgian Rockliffe series, Ms. Riley gives her readers two equally captivating romances which play out in tandem but are very different in tone. The tender romance between Aristide and Genevieve forms a nice contrast to the volatile one between Nicholas and Madeleine. Nicholas has given Madeleine the opportunity to cut him out of her life completely but she simply cannot do it. 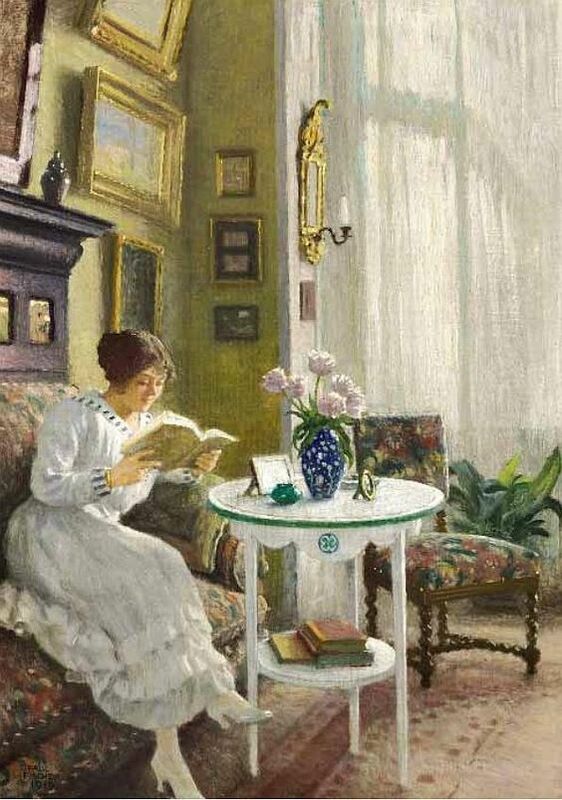 The knowledge that she is not indifferent to him makes Nicholas determined to break down the defences she has built around herself and claim her as his wife. She surrounded herself with an invisible thicket of thorns and a big ‘Keep Out’ notice for good measure. I love how Madeleine, with no thought for her own safety, protects Nicholas when he is attacked. She is just magnificent! I couldn’t help but be touched by her heart-felt words as Nicholas lies unconscious. All her defenses are down and the barriers she has erected around herself have finally fallen. Nicholas has always been regarded as loveable and good-humoured with a dislike of dancing because of his unfortunate habit of stepping on ladies’ toes. Now we see a man who is relentless in his pursuit of the woman he loves. It has been a bumpy ride, with lots of ups and downs, but I was delighted to see Nicholas and Madeleine finally get their hard-won Happy Ever After. 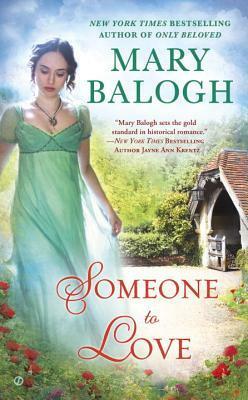 Ms. Riley creates a truly heart-warming romance between Aristide and Genevieve. Like his sister, past events have led Aristide to build emotional barriers around himself and I enjoyed seeing those barriers gradually start to crumble as he falls under his wife’s spell. His awareness of his wife increased with every passing day and not merely when she was within touching distance. He’d developed a habit of watching her across a room and thinking about her when she wasn’t there. He may not be aware of it himself, but his love shines through in the patience, understanding and kindness he shows Genevieve. The scene where he buys her the little puppy is particularly telling because he realises just how devoid of kindness her life has been. Her late husband’s emotional and mental cruelty had destroyed Genevieve’s self-esteem but Aristide gradually restores her confidence in herself as a beautiful and desirable woman. Genevieve gradually discovers that lurking behind that reserve, Aristide is a very different man …honourable, kind, patient, understanding, and someone she can trust; not to mention the other benefits! That cool, business-like façade hides all manner of things … such as when he’s teasing or joking … and the wickedly seductive Frenchman who knows exactly where to touch me and how. 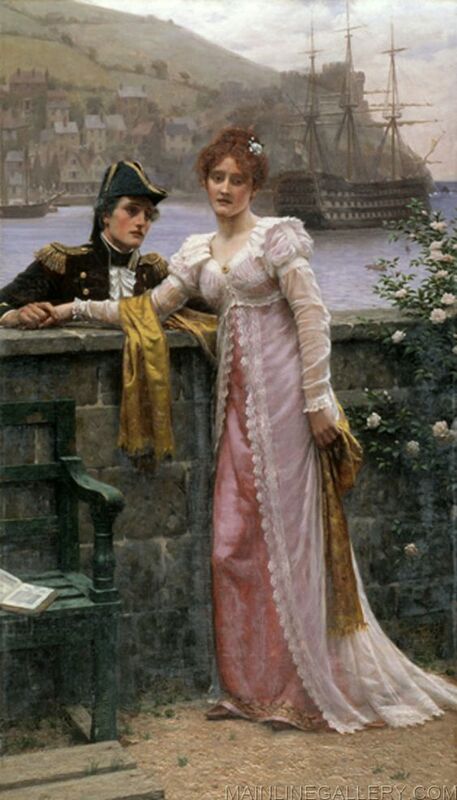 Sir George Braxton’s accusation of cheating with regard to Aristide is resolved in a satisfying way and also adds some dramatic events to the story which are integral to moving one of the romances forward. It also provides one of my favourite scenes where Aristide and the unflappable Rockliffe confront Braxton and the duke scares him (Braxton) half out of wits with just the tone of his voice. Cassie’s warm and unquestioning acceptance of Genevieve. Sebastian didn’t reply but the look in his eyes said something along the lines of, Shut your mouth before I put my fist in it … which only increased Nicholas’s amusement. Aristide’s embarrassment and his friends’ knowing looks when they hear the story of him saving the puppy for his wife. MY VERDICT: Beautifully written, with memorable characters, a well-plotted story and two captivating romances, this is another wonderful addition to this addictive series. Highly recommended. Tragedy drove him into unwilling exile. Death demands his reluctant return. In the decade between, he has answered to many names and amassed a variety of secrets. Now the actor known to Paris as L’Inconnu must resume his real identity and become Francis Adrian Sinclair Devereux, Earl of Sarre … a man he no longer knows how to be and whose name, thanks to the malice of a friend turned enemy, remains tarnished by an old scandal. Revenge, so long avoided, slithers temptingly from the shadows. Grand-daughter of a wealthy wool-merchant, Caroline Maitland is not finding her Society debut either easy or enjoyable … but, to Marcus Sheringham, she is the perfect solution to his crushing mountain of debt. Knowing she will be married for her money, Caroline never believed she would find love; but neither did she bargain for a certain charming French highwayman … and a surprising turn of events. The stage is set, the cast assembled and the Duke of Rockliffe waits for the curtain to rise. In the wings, Lord Sarre prepares to make his entrance. He doesn’t expect to be greeted with applause. After reading The Mésalliance, I was especially intrigued by the actor known as ‘L’Inconnu’, whom Rockliffe recognises at the Comédie Française. Ms Riley subtly hints that a nasty scandal forced this man to flee England eight years earlier and I knew then that this mystery man was destined to have his own book. The Player is the third book in Stella Riley’s fabulous Rockliffe series and we discover that ‘L’Inconnu’ is, in fact, Francis Adrian Sinclair Devereux, Earl of Sarre. Ms Riley excels in writing the most gorgeous heroes and Adrian is no exception. I also love the fact that he is such a complex character. The 21-year-old Adrian, then Viscount Eastry, is about to marry Evie Mortimer, the woman he is head over heels in love with. Life seems perfect but suddenly everything changes; his fiancée is dead and there are accusations that Adrian murdered her. Though he professes his innocence and wants to clear his name, his father refuses to allow the family to be besmirched by such a scandal and eventually Adrian is forced to flee the country. Angry and hurt over his family’s rejection, Adrian is determined to make a new life for himself in Paris. Discovering his aptitude for acting, he soon builds a career as a successful and renowned actor in the Comédie Française. His unique ability to ‘count cards’ and adopt various guises to cover his real identity ensure success at the gaming tables. For the past two years, he has also been a partner in Sinclair’s, an exclusive London gaming-club, with his friend Aristide Delacroix . However, after an absence of 10 years, circumstances force him to return to England to assume his responsibilities as the Earl of Sarre, knowing that society will not be welcoming and all the old rumours and accusations will resurface. He wasn’t going back because he wanted to. He was going because his presence had suddenly become an unavoidable duty. He doubted if anyone would welcome him. …a humdrum existence of Duty and Making the Best of Things; years and years of being sensible and responsible and never, even briefly, knowing what romance felt like. Despite everything, she secretly dreams of being swept off her feet by a dashingly handsome fellow. Adrian wants revenge on his onetime best friend, Marcus, Lord Sheringham, the man who betrayed him and destroyed his reputation all those years ago. He has been keeping tabs on Sheringham over the years and knows that he is deeply in debt, with creditors nipping at his heels. Discovering that his nemesis has Caroline and her dowry in his sights, Adrian sees it as the perfect opportunity to exact his revenge by ruining Sheringham’s plans. But first he wants to discover Caroline’s true character and if she is worth saving from Marcus’s clutches. So, he dons one of his disguises and becomes the dashing highwayman, Claude Duvall, not knowing that the tangled web he is about to weave could cost him the one thing he wants most in the world. Adrian is such a wonderfully complex character. I could understand his sense of hurt towards the family who basically disowned him, and I could feel the anger and bitter resentment boiling beneath the surface during the fraught meeting with his unfeeling mother. Over the years, he has played so many different roles that he no longer knows who he really is. In so many romances, there is an instant spark of attraction when the hero and heroine first meet and it was refreshing to see a very different scenario in this story. Adrian’s initial opinion of Caroline is that she is garishly dressed and socially inept while Caroline sees Adrian as cold, unsmiling and emotionless. It is only when Adrian is in his guise as Claude Duvall that he glimpses a very different Caroline…a woman of character, intelligence, quick-witted and stubborn. In fact, as he is in search of a wife, he could do worse than marry Caroline. However, without giving too much of the plot away, there are complications in the shape of a very determined Marcus Sheringham and it seems that Adrian might just have burnt all his bridges when Caroline discovers his deception. I could sympathise with Caroline’s anger and disappointment at discovering Adrian’s duplicity, particularly as Claude Duvall had been the handsome, dashing hero she had always dreamed of. But she is not one of those heroines who refuses to see the reality of the situation, accepting that Adrian had never intended for matters to go this far or for her to be hurt. I also like her logic in reasoning that, if she enjoyed Claude’s kisses, and he and Adrian are the same person, there was no reason to suppose she wouldn’t enjoy Adrian’s kisses too! Caroline also begins to see that there may be a very different Adrian lurking beneath that cloak of icy reserve. He’s different, somehow. Is this what Bertrand meant? Am I being allowed a tiny glimpse of the man behind Lord Sarre? If so, it’s interesting. But though I’d like to push it further, I’d better stop before he realises what he’s doing and crawls back into his igloo. When he reinstates two formerly dismissed servants, she realises that it is not just an act of responsibility, but he truly cares about them…that he has kind and loving heart which he doesn’t want anyone to see. The romance is sweet and heart-warming and their gradual falling in love seems so natural. They complement each other perfectly; Caroline helps Adrian discover the man he was meant to be while Adrian sees Caroline’s inner strength and beauty. Their declarations of love are positively heart-melting. The Marquis of Amberley (The Parfit Knight), the Duke of Rockliffe (The Mésalliance) and Lord Nicholas Wynstanton, Rockliffe’s younger brother, all prove welcome allies for Adrian and I love their scenes together because, beneath their banter, there is always a sense of the close bond between them. I love Rockliffe…so unflappable even under the most extreme of circumstances. I adored Adrian’s factotum, Bertrand, who is more friend than servant. Knowing Adrian better than anyone, he is the one who provides the impetus for Caroline to think that there might be more to Adrian than appears on the surface. Bertrand also provides some humorous moments with his broken English and questioning of Adrian’s actions. I was certainly intrigued by the exchanges between Nicholas and Aristide’s sister, Madeline, and I do hope they get their own book. Just reading this book is an absolute pleasure, but listening to the audiobook narrated by the sublimely talented Alex Wyndham takes the enjoyment to another level entirely. He brings Ms Riley’s wonderful story vividly to life and captures all the details and personalities of each individual character perfectly. He particularly excels in voicing authentic sounding women’s voices. MY VERDICT: Stella Riley’s brilliant storytelling combined with Alex Wyndham’s superb narration is sheer magic! VERY HIGHLY RECOMMENDED. I was delighted when my friend and fellow blogger, Eileen Dandashi, approached me with the idea of doing a joint review of NOBLE SATYR, an audio book we both loved. It was fun sharing our thoughts and I look forward to doing another joint review with her. Eileen: Thank you for being on my blog and it’s lovely to chat with you today, Carol. I’ve enjoyed getting to know you these past two years and even though you live in Wales and I in California, we’re not so far from each other. For the benefit of our readers, let’s talk about the place you picked for us to meet. I’ve never been to Wales and this is a great opportunity to sit and talk AND visit a nice tea house– Pettigrew Tea Rooms in Cardiff Castle Walls. So, are tea rooms frequently visited by people in Wales? And what type of people come? Carol: I’m delighted to be here today and I’ve enjoyed getting to know you too, Eileen. That’s the beauty of the internet, isn’t it? It doesn’t feel as if we are separated by thousands of miles. A beautiful duchess mourns for her beloved. A sun-bronzed merchant returns to claim a birthright. Disparate souls in need of love and renewal. Hampshire, England, 1777: Antonia, Dowager Duchess of Roxton, has been mourning the loss of her soul mate for three long years. Her despair is all-consuming until into her life steps a devilishly handsome younger man. Unconventional and self-assured, wealthy merchant Jonathon Strang will stop at nothing to convince Antonia she can love again, and deeply. 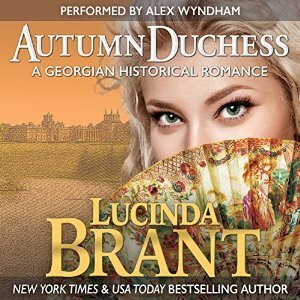 A beautiful and deeply emotional second chance love story by Lucinda Brant superbly narrated by Alex Wyndham – it doesn’t get any better than this! This is the third book in the Roxton family saga and I would definitely recommend reading the first two books because I feel it gives the reader a fuller understanding of Antonia’s emotional state at the beginning of this book. They are also well worth reading. It has been three years since her husband, Renard, passed away and Antonia, Dowager Duchess of Roxton, is still in deep mourning over the loss of the love of her life. She was 20 years younger than her husband and, at the age of 48, is still a beautiful woman. Her son Julian, the current Duke of Roxton, and his wife, Deborah, are very worried about Antonia’s state of mind and, over the past three years, Julian has tried everything to convince his mother that life is still worth living but to no avail. She refuses to put off her widow’s weeds and her lonely days in Crecy Hall, are only brightened by the twice-weekly visits of her beloved grandchildren. Jonathon Strang Leven, a wealthy merchant, has returned from India having made his fortune there. He has inherited a title and estates in Scotland on the death of a distant relative, but is also seeking the return of an inheritance stolen from his ancestor Edmund Strang Leven over a century ago by the Roxton family. This inheritance being Crecy Hall. He also wants to secure his daughter Sarah Jane’s chances of marrying into nobility. Jonathon is completely self-assured, used to getting what he wants and cares nothing for society’s expectations. …he did not do as Society expected. He did not apologize. He was not penitent. He did not bow and scrape and back away to be swallowed up by the crowd. I was totally captivated by Antonia and Jonathan’s love story and enjoyed the older woman/younger man aspect. Having read Noble Satyr (Antonia and Renard’s story), it was easy to see the marked contrast between the vital, exuberant person she once was and the withdrawn, grief-stricken person she has become. I really felt for her son, Julian, who wanted so desperately to help his mother but didn’t know how. I knew he was only doing what he thought best for her although his actions often seemed cruel, unfeeling and misguided. He was at a loss to know what else he could possibly do or say that he had not already done or said, to drag her out of the vat of grief and self-pity in which she was slowly drowning. I absolutely loved Jonathon. Having lost his beloved wife in childbirth many years before, he understands Antonia’s grief better than anyone and he is the perfect person to reawaken her to the joys of living. I love his dogged pursuit of her regardless of the consequences whether it be asking her to dance or turning up for breakfast at Crecy Hall uninvited. I also adore him for accepting that “Monseigneur” will always have a place in her heart. I loved watching Antonia’s initial reactions to Jonathan’s outrageous behaviour and comments. It creates some very funny moments and this is one of my favourites. Antonia was aghast. Angry pride spurred her to give an outrageously candid and thus indiscreet response. But she had always spoken her mind; it was second nature to her. I also loved the inner conversations between Jonathon’s Business Brain, Heart, Stomach and Vital Organ. So funny! Ms Brant weaves elements of factual history into the sub-plot involving Antonia’s cousin who is accused of aiding American Revolutionaries. This also provides some suspenseful moments. If I have one small criticism, it would be that the story ends rather abruptly but, as this is a continuing family saga, I hope to see more of Antonia and Jonathon in later books. Once again, Alex Wynham’s narration was superb. He continues to amaze me with the wide range of character voices he can produce, each distinctive and sustained throughout the book. I have listened to Noble Satyr and Antonia’s French accent is exactly the same pitch and tone that I remember from that book. 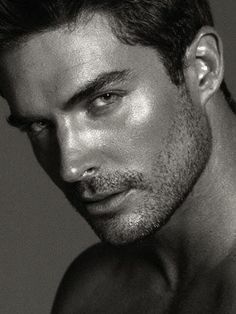 His rich, smooth voice is perfect for the deliciously gorgeous Jonathon and his narration of the passionate, romantic scenes made my toes curl. MY VERDICT: A beautifully crafted, superbly narrated and emotionally satisfying love story that truly touches the heart. Highly recommended. 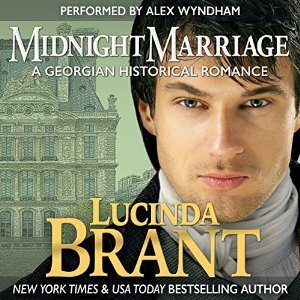 Set in the opulent world of the 18th century aristocracy and inspired by real events, Midnight Marriage is the standalone second book in the acclaimed Roxton family saga. What an amazing introduction to the world of audiobooks this was! The combination of writer Lucinda Brant and narrator Alex Wyndham was definitely a match made in heaven. This is the second book in the series and Ms. Brant certainly captured my attention with the hasty, secretive marriage of the title. It left me intrigued to know the “whys and wherefores” surrounding this mysterious event and so I had to keep reading. As the story unfolds there are various twists and turns, with hidden secrets, deception, heartbreak, passion and old enmities. Julian is charming, caring and witty but, as son and heir to the powerful Duke of Roxton, he has also inherited the Roxtons’ arrogant streak. His reputation as a libertine is widely known but sometimes things aren’t always what they seem. Sorry to be rather cryptic here but I don’t want to spoil the story for anyone. His relationship with his father has never been an easy one for reasons we discover later in the story and I found this a very interesting facet of the story. 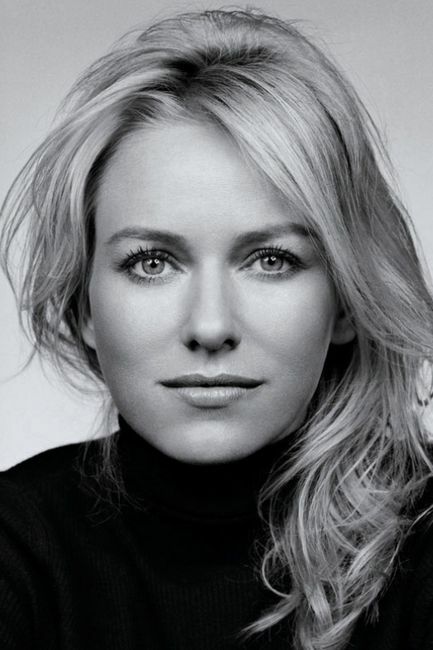 As cousin to the 5th Duke of Devonshire, Deborah is well-connected. However, her reputation was severely tarnished when, at the age of sixteen, she went to Paris to care for her sick brother, Otto. He is the black sheep of the family having married a gypsy. Deborah only compounded things by bringing Otto’s son, Jack home to live with her after both his parents died. Deborah cared more for her brother and her nephew than society’s censure and I admired her for that. The idyllic time Julian and Deborah spend together before she discovers his true identity make the subsequent events more heart-breaking. Julian thought he would be able to just smooth things over and Deborah would simply forgive him…foolish man! Deborah has a mind of her own and, although I might question her reaction given how much she loves him, Julian’s subsequent cruel and harsh treatment of her had me sympathising with her. There is a lot of anger and hurt to overcome plus a very dramatic finale before these two can finally share a Happy Ever After together. The secondary characters all add depth to the story and I will definitely be listening to Noble Satyr, the story of Julian’s parents, the Duke of Roxton and his younger wife, Antonia. Ms Brant really made me feel as though I was stepping back in time to the Georgian world of powdered wigs, panniers and sedan chairs. Alex Wyndham is a superb narrator and I was totally swept away by his deep, rich voice. Each character is pitched perfectly – male or female, old or young, noble or servant – and I was amazed at his ability to sustain such a wide range of characters’ voices throughout the book. I found it easy to distinguish between narrative and dialogue and I knew instantly which character was speaking. MY VERDICT: Ms Brant weaves an intricate and compelling story which Alex Wyndham brings superbly to life. Highly Recommended! THIS BOOK WAS JUST AMAZING! Lorraine Heath weaves a beautiful, deeply emotional and moving story that is both heart-breaking and heart-warming. I love how both Avendale and Rose are such multi-layered characters… far more than they first appear. Avendale seems to be a typical rake, indulging in a life of drinking, women and gambling, caring for nothing except his own personal needs, while Rose is a con-artist fleecing wealthy noblemen. But they each have secrets that have shaped them into the people they have become. At the age of seventeen Rose ran away from an abusive father taking her younger brother Harry with her. She was forced to do whatever was necessary to support them and her small extended “family”. Avendale had chosen to bury his dark secret beneath a life of debauchery rather than face it head on. It has left him very much a loner, afraid of becoming emotionally involved. I love how Ms Heath takes the time to build the romance between them showing the gradual changes in their relationship and the love growing. Here are some of my favourite moments. It had been building between them from the moment she felt his gaze on her that first night, from the first word, the first assessing glance, the first touch. Then all thoughts fled her mind as he slowly stroked a blunt-tipped finger along the inside of her upper arm, above the glove. Down. Up once more. Within her, he ignited flames that began at the tips of her toes and rose ever upward. Strange how, looking at her now, he experienced a flash of contentment, surrounded by this unusual assortment of people. If Avendale and Rose are the heart of the book then Rose’s brother Harry is surely the soul. He totally captured my heart and his story is so poignant and heart-rending that I was reduced to floods of tears. Every time I think of the book he is writing, it brings a huge lump to my throat. It’s wonderful to see the genuine friendship that develops between Harry and Avendale and the scenes they share are some of my favourites. They also reveal so much about Avendale that he has kept hidden…his compassion, his caring nature and his generosity of spirit. I love how he gives Harry the opportunity to have so many amazing experiences. It was easy to fall in love with this Avendale. I also understood the driving force behind Rose’s actions…her overwhelming love for her brother. For this reason, I couldn’t condemn her even though her actions were morally wrong. After all, she only conned wealthy men who could well afford it! I must mention Merrick, his wife Sally and Joseph, Rose’s unusual little band of servants and her stalwart supporters who add richness to the story. In the Epilogue, the final entry in Avendale’s journal is both beautiful and romantic, but most moving are the last words which are from Harry’s book. My Verdict: This is such a beautifully crafted and emotionally satisfying love story which really touches the heart. A MUST READ!